2013 Sprint for Monroe Race results are in! Click here. Join us June 2, 2013 at Wolfe Park! 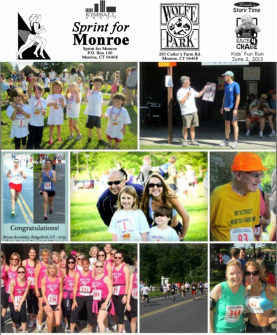 The Kimball Group, Newtown Savings Bank and Magas Media Consultants, LLC would like to invite you to run, walk, or cheer on participants at Wolfe Park on June 2nd, 2013 and make this year’s 21st Annual “Sprint for Monroe” a great success! Rain or shine, the 21st Annual Kimball Group Sprint for Monroe gets underway Sunday, June 2nd, 2013 at Wolfe Park, 285 Cutler’s Farm Road, Monroe. The annual 5K presented by the Monroe Police Department is a USATF Certified* course with computerized timing. Event information and a mail-in registration form can be found here and by visiting www.hitekracing.com. Through the years, the Kimball Group Sprint for Monroe (formerly the Sprint for D.A.R.E.) has grown to become a family and community tradition offering opportunities for every age group to participate. In addition to the 5K-road race, the day’s events include the timed Annual 5K Walk and the Race for Chase Kid’s Fun Run, a non-competitive event for younger runners. Every finisher in the Fun Run is a winner; all who complete the course receive medals and t-shirts. The first 500 5K registrants receive gift packets and t-shirts and all are eligible for a random drawing of prizes donated from local merchants. John Kimball, owner of The Kimball Group, joins the race for the 6th year as title sponsor and Newtown Savings Bank returns as the premium sponsor. Presenting sponsors are Mr. Handyman of Fairfield County, AQUAhydrate and Minuteman Press. In addition, over 75 local business sponsors have pledged their ongoing support in cash donations, raffle items, and food and beverages for a post-race celebration in the park..
Top finishers completing the USATF certified course will receive cash prizes and trophies. Also part of the day’s activities are food and beverages such as coffee, donuts, pastry, fresh fruit and raffle prizes which include a mountain bike from Cycle Fitness, watch from Swiss Army brands, and Polar Heart Rate Monitor. * A USATF-certified course is a road race course whose distance has been certified for accuracy.